As the cold weather chills our bodies, we won’t let it beat our spirits! If we aren’t laying out on the beach basking in the warmth of the sun, we can always imagine we are. We can do the same with our homes while we’re huddling around the fireplace and staying cozy under our warm blankets. A little tropical inspiration in our homes can go a long way! If you need a winter weather pick me up, here’s a couple tropical inspired spaces that will do just that! Here’s to warmer days and looking forwards to summer time. 2015 is quickly coming to an end. We’ve got a grand total of three days left in this year. We’re hoping that it’s been a great year for you, but we’re really hoping 2016 is even better! A new year can mean a new you in every way, shape and form. It can also mean a new home transformation for you to start off the new year. It’s a great time to explore those ideas and styles you’ve always been interested in. Get inspiration from the pictures you find yourself pinning or step outside of your comfort zone and dive into a style you haven’t tried yet. It’s a great project to start at the beginning of the year. Give yourself an opportunity to change with your home. Not looking to tackle it on your own? Then let us help you! The designers here at the Tuvalu Design Studio love teaming up with clients to create the perfect space to fall in love with. If you want more info on our interior decorating services you can find it here. Curious to see what we’ve helped our client design? 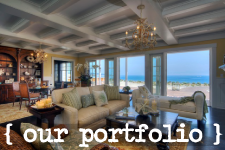 Browse our portfolio here! This Monday we’ve gathered some fantastic inspiration for nautical bedroom ideas for kids! We love all the fun and bright colors in the spaces! Plus decorating a kids room lets you pick out cute accessories for the space which lets you channel your inner child. Have fun with these spaces and see what these designers have done in these nautical style bedrooms. Get those pin buttons ready and hit those boards! Here to another great week with a little coastal inspiration to start you off! If you want more nautical or coastal home decor style pins for your Pinterest boards, check out the Tuvalu Home boards here! This week’s Tuva-Luv is provided to us by Gracie! One of her store favorites is the Ahoy Apron! The Ahoy Apron has a knotted collar, a sewn-in towel and is embroidered with a cute anchor. The navy stripes and colorful zigzag offer a fun look to the apron as well. Check out the Ahoy Apron on our online store here! Wrap your Christmas gifts like a pro this year! We’ve got plenty of wrapping accessories to help you wrap your gifts super cute! We’ve got cards, wrapping tape and cute yarn string to help finish off those presents! Come on in and pick up what you need so you can get those presents ready for Christmas morning! Don’t forget when you buy gifts at Tuvalu Home we will wrap it up for you in the store! We’ll get it ready to go so you can place it right under the Christmas tree! Let us help you this holiday season so you can focus on the fun parts of Christmas! Check out some of our gift wrapping below! Merry Christmas! Christmas is almost here! Just a few more days and it’s Christmas! Naturally, we’re going to use the Monday Pins post before Christmas to post more Christmas photos. Get those pin buttons, but more importantly get ready for Christmas! Here are a few more coastal Chirstmas inspired pins for your Pinterest boards! Merry Christmas! If you want more holiday and coastal decor pins, check out out Pinterest page here! Our Cheers Stemless Wine Glass is featured on The Gloss! It’s listed on their “The Perfect Gifts for Your Friend Who Loves to Party” list! It’s the perfect glass for Celebrating! This metallic gold and confetti stemless wine glass is a sure way to cheers in the fun time! Check it out on our online store here! This week’s Tuva-Luv comes from Emily! One of her Tuva-Luvs is the Uttermost Shyam Table Clock! This clock features a metal frame with a brass finish and aged black stand. It’s a great piece to add some unique style and texture to a space. Check out the Uttermost Shyam Table Clock here! If you’re interested in more Tuva-luvs you can head over to the page and see what the team luvs here! Keep things simple this year with minimal Christmas decor. Using a few staple, holiday decor pieces can go a long way in the home. You can use a small Christmas tree or even just a few stockings to help get a simple holiday message across. Maybe you’re not feeling like digging out all of the Christmas decor buried up in the attic this year and there’s nothing wrong with that. Keep it simple and go minimal. That way you can feel the holiday spirit and save yourself the hassle. Check out these spaces that have minimal Christmas decor, but maximum Christmas cheer!